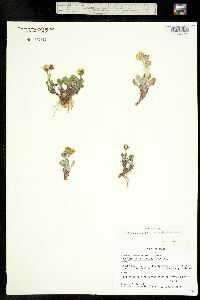 Locality: United States, Colorado, Moffat, Stony Basin, ca. 7 miles northeast of Silverton, San Juan National Forest. On east-facing ridge of Green Mt. Habitat: Fellfield on east-facing ridge. Notes: Packera werneriifolia, det. by W. A. Weber 1985. Originally ID as Senecio werneriifolius.